Are you trying to keep cool during the hot months, but you don’t have central air conditioning in your home? Or, do you have a central AC unit, but are tired of paying the high monthly bills it costs to run it? Either way, you don’t have to settle for the agonizing heat inside your house. 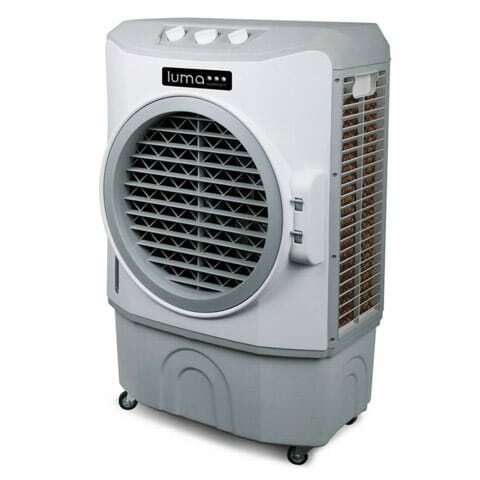 A portable AC unit is the best way to keep you cool while giving you the freedom to move the device from room to room. But, what is the best portable air conditioner to buy? In this post, we’ll explain everything you need to know so you can make the best choice possible. 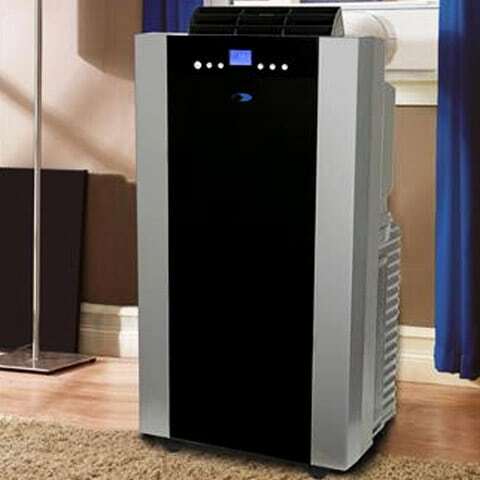 We’ll also show you what the best portable AC unit is for each size room and how to pick the right one for your needs. One of the major benefits of owning a portable AC device is that it drastically cuts down on monthly energy costs for cooling your home. With a central air unit, you have to pay for it to run throughout the entire house even if you just want to cool down one specific room. The average homeowner spends $100-200 per month for this type of cooling system. By comparison, a compact cheap portable air conditioner uses one-eighth of the electricity required to run central air, which comes out to about $6-15 per month to cool a room. The biggest competitor for portable AC devices are window mounted air conditioning units. If interested, we have an entire guide on the best window AC units here. However, window units don’t comply with most building codes and HOA regulations. If you rent an apartment or live in an HOA zone, you can’t use them. Portable units don’t have this restriction since they don’t protrude from the outside. This makes these devices one of the best investments you can make to enjoy cooled air. Most portable units are very lightweight, and as long as there’s an electrical outlet and a place to vent the warm air, you’re good to use it. Not many people know this, but there are actually two different types of compact air conditioners you can buy. If you confuse the two, you could end up making a costly and inconvenient mistake. A product that carries just the label “portable” is outfitted with a dual hose or single hose unit that transfers hot air from inside a room to the outdoors. This means that it has to be installed next to a window, so the hose can be vented to the outside. A product that includes the word “ventless” or “evaporative” doesn’t use a hose for ventilation. Instead, it uses a tank of water and the natural process of water evaporation to cool warm air and a fan to expel the newly, cooled air into the room. Oddly, a “ventless portable air conditioner” is much more portable than a “portable air conditioner.” It’s easy to move from room to room, just like a rolling chair, whereas the latter requires extra work to take down and set up. So, Which Type Should You Get? It may seem like an obvious choice to buy a ventless or evaporative air cooler because it’s a lot more mobile. However, there’s actually a more important factor you need to take into consideration. And that is the humidity levels of where you live. As you just learned, portable and ventless air coolers work in different ways and if you don’t buy the right one for your area, you won’t get the best results. Portable AC units are best for humid climates because they cool the warm air by removing moisture from it. That’s why it must be connected to a window. Ventless AC units are best for dry climates because they add moisture back into the air to help cool it. However, there must be a constant supply of fresh air (like an open window or door) to avoid overly-saturating the air inside the room. 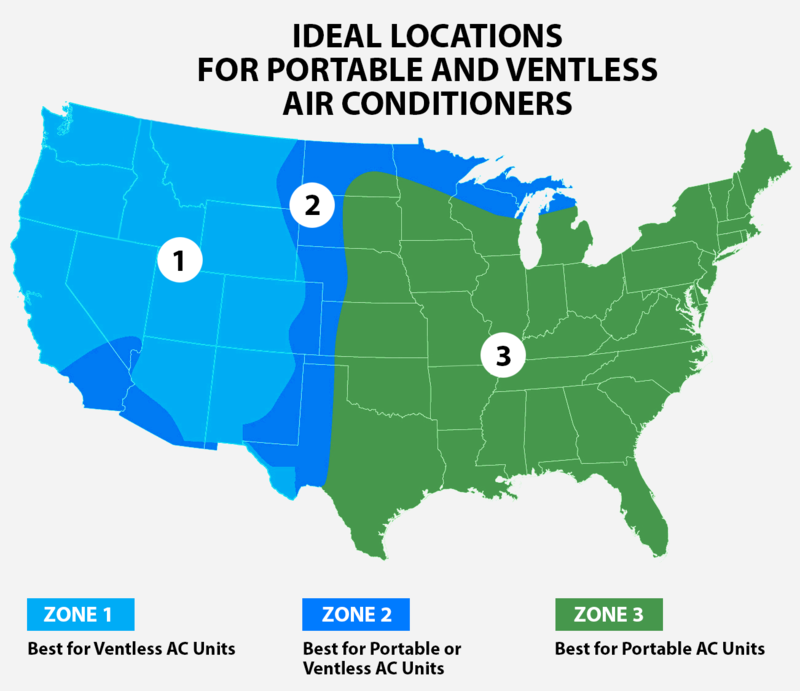 Take a look at the map below to quickly determine what the best portable air conditioner type is best for your region. Now that you know how to pick the right kind of air conditioner for your home, the next step is choosing a model that’s properly sized for its location. While these numbers may seem complex, they’re actually quite easy to understand. Each one pertains to a maximum square footage that the air conditioner can handle. These numbers are important because you don’t want a ventless or portable air conditioning unit that’s rated too high or too low for the room you want to use it in. For example, you don’t want to buy a model that’s too weak to cool down a large room. This will increase your monthly energy costs and leave the room feeling hotter than you desire. On the flip side, you also don’t want a unit that puts out too much power for a small room. You’ll spend too much money on the initial purchase and the smaller than intended space will cause it to overwork itself and eventually break down. What you do want is for the AC unit to be sized just right for maximum efficiency and cooling performance. Using a tape measure, measure the length and width of the room you want to put the portable AC unit in. For odd lengths, round up or down to the nearest whole foot number. Then multiply these two numbers together. This will give you the square footage of the room. For example, a room that is 29 ft. 8 in. long by 21 ft. 4 in. wide, would round up to 30 ft. by 21 ft. Multiplying these numbers together gives you 630 sq. 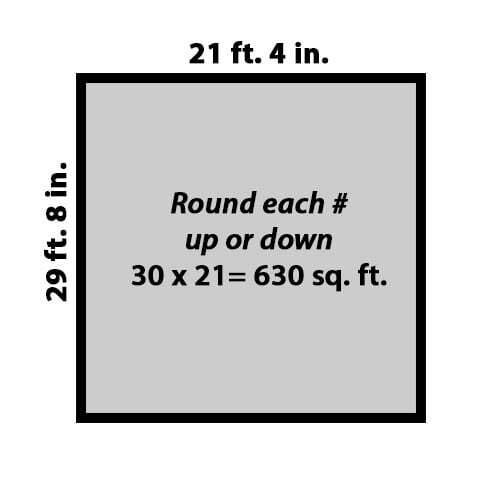 ft.
30 x 21 = 630 sq. ft. This is the maximum amount of space you want your compact air conditioner to cover. Below is a quick reference chart to find the right BTU capacity for your needs. BTU is short for British Thermal Unit which is the traditional unit for heat. Take the square footage of the room you measured and find the associated BTU number. 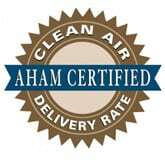 Then, look for a portable air conditioner that has this rating in order to get the best value. Using our previous example of a large 630 sq. 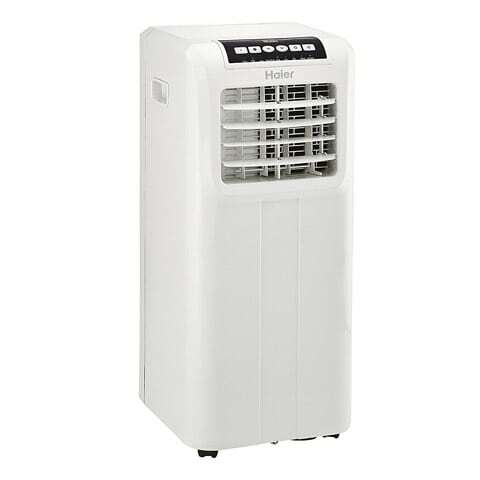 ft. room, the correct BTU portable air conditioner would be one with a 14,000 BTU unit rating. In contrast, a small room air conditioner for 200 sq. ft. would only require an 8,000 BTU unit rating. 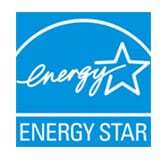 Unfortunately, CFM ratings don’t always match up as perfectly as BTU ratings do for square footage measurements. For example, our top pick for a ventless portable air conditioner below for large rooms has a 1650 CFM rating and covers up to 650 sq. ft.
Another product, not listed here, has a lower 1540 CFM rating yet covers 800 sq. ft.
Luckily, 99% of ventless air conditioners include the maximum square footage along with the CFM number in the product title or description. So, you really don’t have to worry about getting the CFM number wrong when shopping for an evaporative cooler. Now that you know what to look for when choosing an AC unit for your home, we can move onto showing you what the best portable air conditioners are for every size room. The list below will save you countless hours of research because we’ve done all of the hard work for you of narrowing down the best portable AC unit and ventless versions. No matter which model you pick, you’ll know that you’re getting the top value for your money along with excellent cooling performance. If you’re looking for the best portable air conditioner for a small size room, this is it. This product is perfect for bedrooms, dens, and home office spaces and has great efficiency ratings. It can handle up to 250 sq. ft., has three cooling settings and a 24-hour timer. The push button controls and LCD screen make it a snap to operate, but also comes with a convenient remote control. If you’re in the market for a ventless air conditioner, this is the most cost-effective small room air conditioner you can buy. It can cool a room up to 250 sq. ft., has three cooling modes, oscillation, and a 7.5-hour timer. Everything can be operated by a remote control and the wheels casters make it easy to move from room to room. The water tank holds 1.76 gallons, which can last up to 8.5 hours of continuous use before refilling. If you’re trying to cool a medium sized room, like a living room or apartment space, this is the best portable AC unit available. 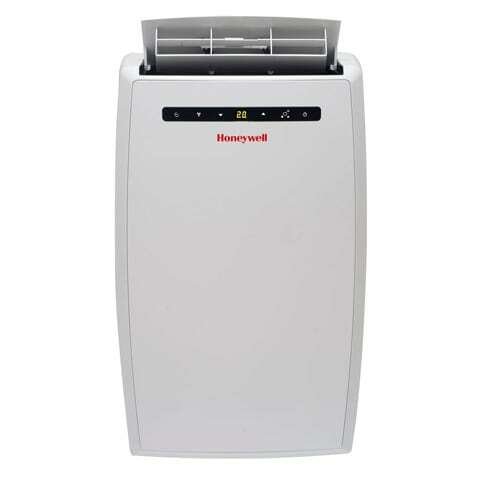 This compact Honeywell portable air conditioner has more than 1,800 positive reviews and can cool and dehumidify a space up to 350 sq. ft. It also has a fan-only mode if you’re just looking for a cool breeze without the chill. Easy operation is controlled by buttons on the device or through a remote control. 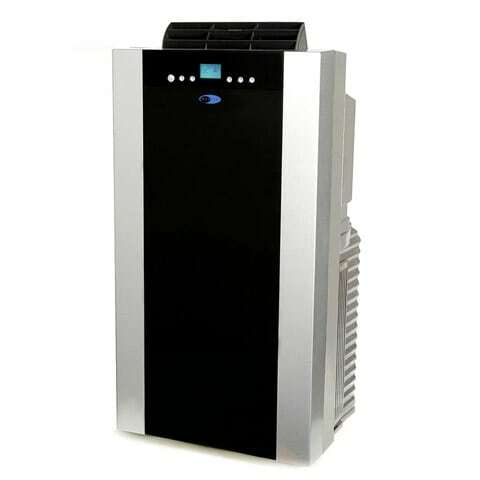 This evaporative cooler is the best in its class for use in areas with low humidity (1,000+ positive reviews). It covers up to 320 sq. ft., which makes it ideal for most home applications. Additional perks include four cooling speeds, oscillation mode, and an LED control panel. Under normal use, the 7.9-gallon water tank only needs to be replenished every 48 hours. 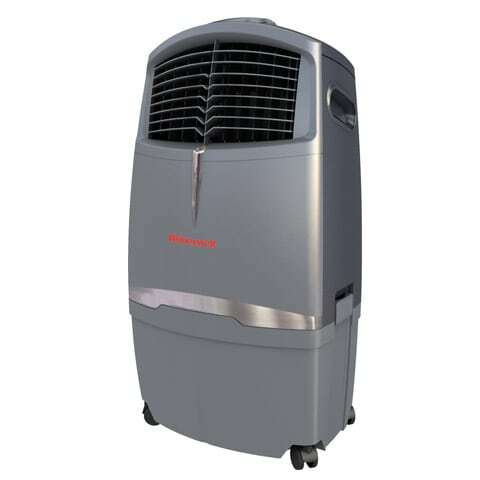 If you want a super stylish portable AC unit that covers a ton of space, then you’ve found it in this machine. No other product on the market looks this good and can handle a room up to 500 sq. ft.
It’s perfect for large living rooms, office spaces and single levels in a townhome. With digital controls, three cooling speeds and a 24-hour timer, you’ve got the best of everything in this product. Plus, it’s one of the quietest portable air conditioners around. Finally, it also includes a carbon air filter, which purifies the air and leaves your home smelling fresh and clean while producing cooled air. Hands down, this the biggest and best evaporative air cooler around. For home use, it can’t be beat. It covers up to 650 sq. 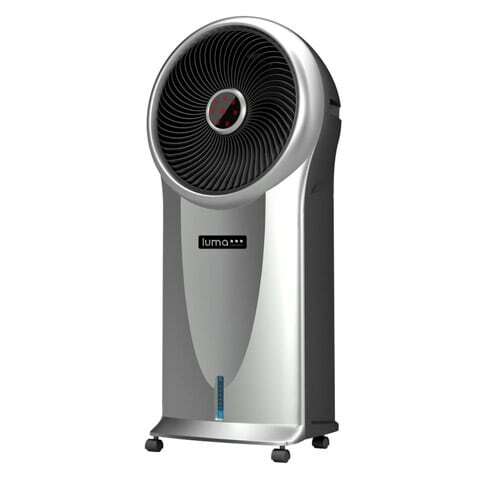 ft. (which is HUGE) and offers three cooling speeds,, as well as an oscillation feature. What’s also great is that it has a direct line input for water, which means you can use it outside and continuously without having the refill the water tank. For indoor use, the 10.6-gallon water tank can last three or four days before you even have to think about refilling it. If we have to give this air conditioner one critique, it would be that it uses old-school rotary dials, as opposed to modern digital controls, but given all of its power, it’s not that big of a deal for most people.